River Cottage – Perfect Kauai Vacation Rental for Honeymooners. It’s no surprise that the River Cottage is our most popular Kauai vacation rental. With its antique furnishings and secluded location, it has all the charm and romance of days gone by. Originally constructed in 1943, the River Cottage still retains hints of its storied past. The hardwood floors are all original to the vacation home, and we’ve outfitted the interior with antique-style furnishings. 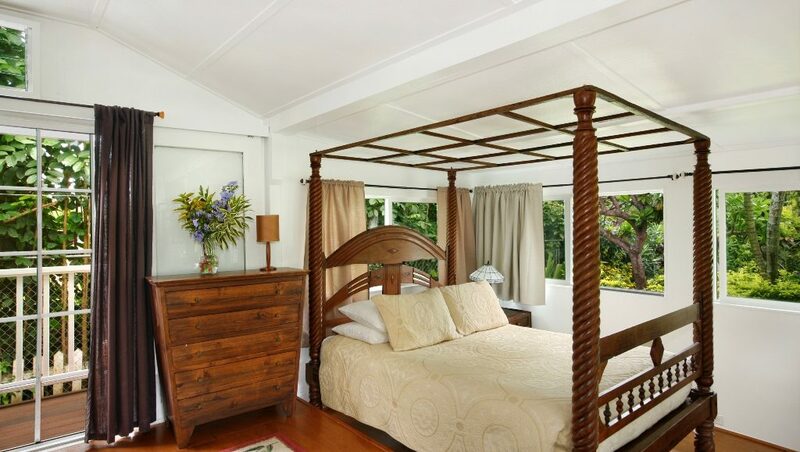 The understated elegance of the vacation cottage makes it the perfect setting for Kauai honeymoons and other romantic getaways. The River Cottage comes with a fully equipped kitchen, a tiled shower, and a café table for two. The vacation rental also has a private lanai and an outdoor dining area. In terms of its location, the River Cottage couldn’t be better situated; because it’s somewhat removed from the other vacation homes, you’ll feel like you have the garden all to yourself. plus tax of 14.42% and a one-time cleaning fee of $175. This is our most popular vacation rental, so book your dates today before it’s too late!